Running from east to west on a bluff above the river, Factors Row and Factors Walk are unique collections of red brick buildings that were once home to Savannah’s cotton industry. Factors Row boasted the Cotton Exchange, where cotton brokers set worldwide prices for the white textile commodity. It was also the locale of warehouses and a series of iron and concrete walkways known as Factors Walk, which connected the structures to the bluff. Today, these buildings have been renovated into antique shops, historic inns, pubs, restaurants and specialty shops. 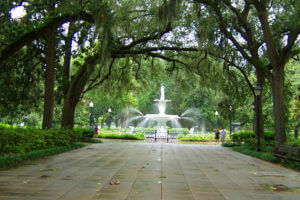 With a history stretching back to the early 1960s, the Fragrant Garden in Forsyth Park is located just northwest of the Confederate Monument and adjacent to Whitaker Street. There, you’ll find a hidden oasis created by Trustees’ Garden Club of Savannah. Featuring walls meant to keep the fragrance of flora inside the green space, the Fragrant Garden is a particularly unique experience for blind visitors. Bronze plaques in Braille and English provide the names of the plants as well as their Latin monikers. Listen to the peaceful sounds of the garden’s fountain or, if you’re lucky, a local musician strumming a guitar. Estimated to be about 300 years old, making it one of the oldest living landmarks in Savannah, the Candler Oak Tree stands 54 feet tall with a circumference of 17 feet and average crown spread of 100 feet. Located on the property of Savannah Law School on Drayton Street, adjacent to Forsyth Park, the Candler Oak is a live oak tree added to the National Register of Historic Trees in 2004. Interestingly, the tree sits on grounds that have housed orchards, cattle and prisoners of war. It even has its own parking with four spaces in the adjacent lot reserved for the tree’s lowest branches. Behind a red door on W Congress Street, located inside Savannah’s prohibition museum, lies this 1920s-era speakeasy, serving authentic Prohibition-era cocktails; bartenders are dressed to the nines and the decor embodies the true spirit of the era. Patrons are asked to “dress to impress” when visiting the bar and there is no service on Sundays, keeping with the theme of the decade.